Full sleeve blouse designs: Here are some full sleeve blouse designs that have been worn by some of your favourite stars. A full sleeve can be worn in many ways and we have some suggestions. 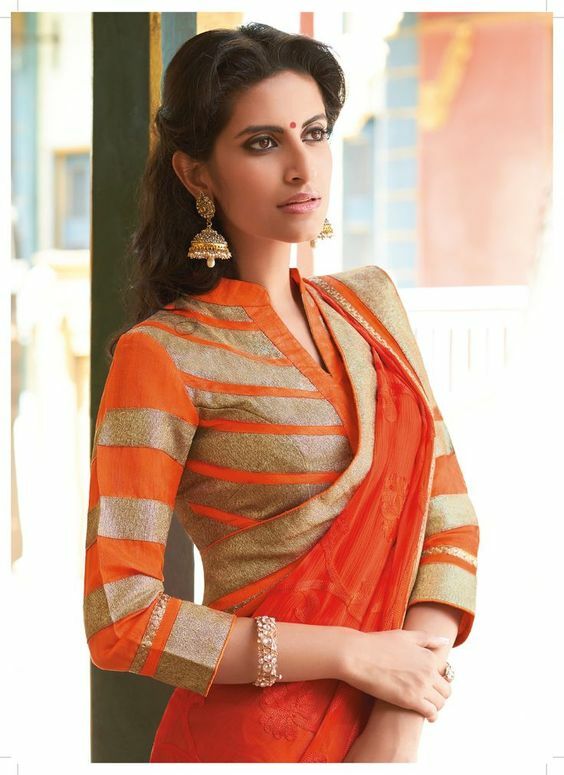 Whether it is a simple Silk Saree or a Benarasi, a blouse enhances the beauty. If you are going for parties, then having a full sleeve blouse in your wardrobe is a must. Do you think these are boring? Then you haven’t seen the beauty of these blouses. We have some spectacular full sleeve blouse designs for you that you cannot miss. But yes, keep in mind, that before choosing the right design, it is always ideal to choose the right fabric. You don’t want your blouse to look out of sorts. Therefore, always check with your blouse designer if your chosen blouse design will go with the fabric. During winters it is good to go with georgette and other material as they will make you feel warm and they look gorgeous at the same time. Even though they are high collared, they have some glitz added to the top portion so that you look pretty in them. Often they are very high up your waist so you can see that the outline of your stomach and the Saree is wider. This can be changed if you don’t want to flaunt your abs. But if you do, this will be a good way to get some eyes rolling. Usually the heavy design is at the neck – you can see that there are jewelry pieces attached to the neckline. If you are feeling too cold during winters, it will cover your neck too. This is the added advantage of having such an all around blouse. This type of design will flaunt your shoulders. In case you have a large tummy, wear this blouse. It will create a distraction from your midriff and make you seem like you have a right proportion. In fact, it will make you look hotter. But many a times the sleeves themselves are also of the net. This means that your arms and upper body will be on display. Wear it comfortably if you are at it. Go with the velvet full sleeve blouse as it will add the right tinge of perfection in your regal avatar. One thing is a must – if you are doing a velvet design, then you must either go full solid or half embroidered. The latter won’t ask you to put on a lot of accessories but with the former, you will have to throw in some accessories. The Princess cut blouse design will look stunning if you have an average frame size. If your upper body is too heavy then you may not want to go with a light color blouse and deeper cut. But if your body weight is normal, then a princess cut blouse design is the best to have. It will show off your assets and also highlight the slenderness of your neck. This is quite similar to the transparent blouse. But the only difference here is that the net and embroidery knitted blouse is quite gorgeous looking. It is ideal for any festivity in the evening when you want to flaunt some skin. Yes, we just told you how to flaunt some skin even if you are wearing a full sleeve blouse design. Weddings are a colorful affair. What better way to get onto with the colors than wearing multi colored designs on your sleeves? This blouse design will look particularly stunning with chiffon Sarees. So you can wear it on your casual visit to the wedding event. Similarly you can flaunt your look in it when you are visiting the mehndi ceremony. Experiment with colors and you won’t be disappointed. 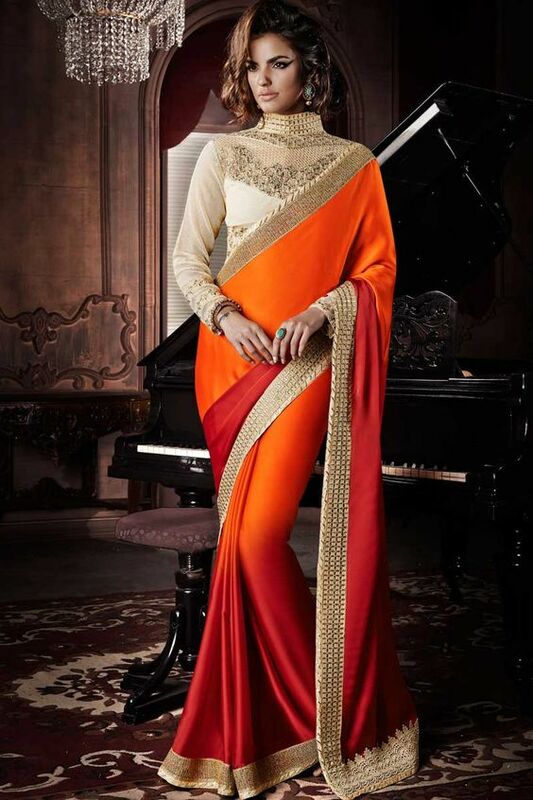 Don’t forget to mix and match a pretty Saree with it. Do you want to give off some mystery? Boat necks make the onlooker really curious. Typically a boat neck design has the neck pulled to some extent. This makes your neck area look thinner. Also, the boat neck design can make your shoulders have a high appeal. If you have a bigger bosom and you are not comfortable flaunting it, then boat neck will come to your rescue. Another thing with the boat neck design is that you can either wear it simply as Sonakshi did in the ramp (with solid colored sleeve) or you can have heavily embroidered sleeves (like Aishwarya at Cannes). A boat neck choli would also make you the talk of the town. Brocade designs are the most feminine in my opinion. They enhance your curves and make your bosom look just the right kind of feminine. But you will have to wear the Saree in such a way that the brocade design shows. Typically a Kanjeevaram goes really well with the brocade full sleeve design. Let the outline extend up till your bra inner line to give you that complete look. Yes, we are still talking about a full sleeve design, but the colors are half and half decorated. Typically the bolder color is at the lower arm and the lighter colors are at the upper arm, but depending upon your choice, you can make both the colors bold. Another thing that women do nowadays is add net on the upper half and red color at the bottom half. This too doesn’t fail to stun us. One thing you have to keep in mind is that you have to have a lot of glitter in your Saree if you want mirror work done on your blouse. Only then can it be worn perfectly. But then again it will be a really unique thing for any event. Although this trend is nothing new, but it has been decades since this design has been in the market. If you bring it back in style, you can do so at the next wedding you are invited to. Another beautiful mirror work design that broke the internet is the round back cut with mirror embroidery. You can try it out as well. It looks good on orange colored or green colored blouse. Backless blouses are the best – especially in a full sleeve design, unless you are hesitant to flaunt your back or you are feeling too cold, this is one you should go for. They will never disappoint you. A woman looks stunning in a full sleeve blouse with bare back. You can also make some elements to add to it. Some women like to add strings to it. You can also half bare it by making the cut shape round. Puff sleeve blouses make you look really royal. You must have spotted these on Bipasha Basu. If you imagine her figure, she has a really broad shoulder and wide hips. If your figure is also like that then you know that you can mimic her style. Any time you put a puff to your blouse, it makes you look like a Princess. To undertone the effect of the full sleeve you can also add net work to it. The collared jacket style cholis allow you to take the Saree in a different style. 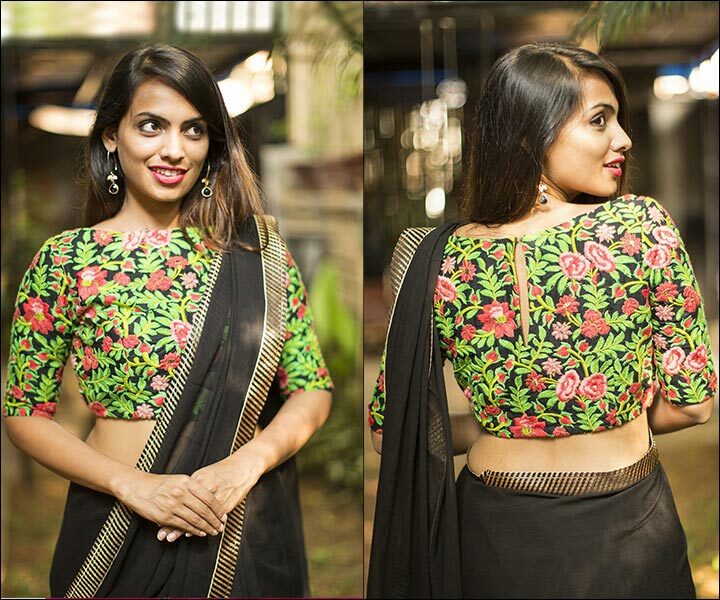 It is a unique way to add an Indo-western twist to your Saree. 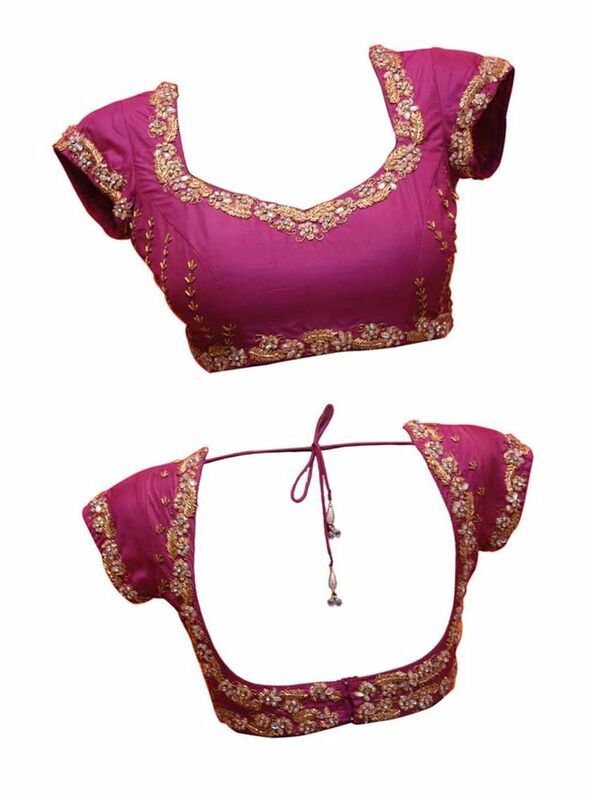 You can say that there are very few blouses that allow you to implement the Indo-western style – this is one of them. These also have a unisex appeal. So if you have a workplace event – or a colleague’s wedding or party evening, then you can wear it to them. Nowadays the youngsters are buying full sleeve crop tops online and wearing them as blouses for their improvised designs. These crop tops are also cold shouldered. So when they are wearing them, there is slight slit below the shoulder which is very apparent. This allows them to have the appeal intact. The floral prints also go well to complement the feminine look and you can typically wear them anywhere – from daily commute to an event. These blouses have a little ruffle at the lower end. These are the exact opposite of the puff blouses which have the puff at the upper end. So if you are bold enough and if you want to break the mould then try these new designs, we are sure you will not regret it. Close neck designs are one of a kind and you know that when you wear them you cannot look anything but the best. A high neck blouse will make you look very elegant. It might also make you look a little older than your age. Make sure you go with a vintage hairstyle to finish the look. Since you will probably need a long necklace or none, you can always finish off the look with a pair of large earrings. Chinese collar was popular in the 80s but it is making a comeback once again just like all good things. Let me tell you – a Chinese collar will make your bosom look really even. If you are a little older and if you have bigger bosom then go with a V-neck blouse cut or a Chinese collar because it will totally make you look sensuous. Plus, it won’t make your bosom look very out of shape either. If you are going with a plain Saree, then team it up with a heavily embroidered full sleeve blouse. This will give you an overall full sleeve look. This design was brought back to life by the Manish Malhotra collection of 2015. It has been seen in many movies since then and it is becoming a hot trend slowly. Heavy embroidery on full sleeve blouses never fails to amaze us and this time too it has not disappointed us. Hope you enjoyed my article Full sleeve blouse designs. Please do not forget to like, share and comment. thank you for wonderful designs.